How To Understand Your Audience – Take A Deep Dive! Home / How To Understand Your Audience – Take A Deep Dive! Knowing your audience is a significant key to online marketing success. It is this understanding that shows you what people need, how they need it, where they need it, and at what time they need it. If a company wants to be a market leader, then they need to understand who it is they want to be a leader with, as this insight is what guides everything else from site design, to copy, to images, to colors, tactics, etc. So how do we accomplish this task? We take a deep dive into our audience. I have seen many a company overlook the value this provides due to the work it takes. Many feel it’s just too much to do, and although some businesses do well without this data, they are seldom the leader in any vertical. What do they need to feel comfortable enough to do what you want them to do? Three simple questions, but not always simple to answer. To dial in your audience understanding which provides a playbook and competitive advantage for you, you will need to answer these three questions better than your competitors. So, where do you start..? 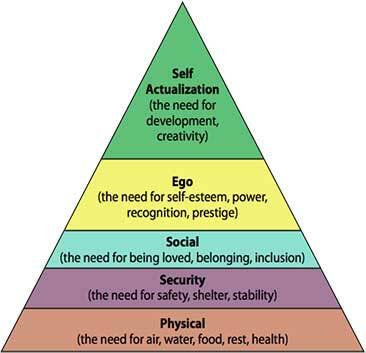 The first thing that you want to understand is, what type of need are you addressing? Where does it fall within someone’s psychological makeup? You need to understand this so that you are presenting people with the correct marketing messages and positioning it where it is most likely to be seen. Maslow’s triangle can also help you decide on what colors, based on the psychology of color you might want to use, and what imagery you might want to use. The need and your tactics need to match. For example, if you are running PPC campaigns, understanding what need your offer is addressing, can significantly help with writing ad copy. For ego, write ego ad copy, for security, write security ads, etc. Complexograms helps you identify the complexity of the sale, i.e., what challenges you are going to have to overcome, and enables you to prepare. I some cases there will be a great need, and risk may not be a huge factor. In other instances, educating people will be needed; and what about consensus, is there more than one person that you are going to convince? By understanding the complexity of the sale, you can better understand what tactics and what channels you might want to use. For example, looking at the complexogram above, we see that there is a great need and that risk, really isn’t going to be a problem. At the same time, knowledge is limited so some education will be required. 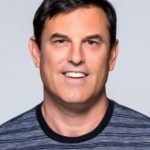 Finally, we see that we are going to have to sell more than just one person, which could indicate a longer sales cycle which in turn, can help understand what tactics are going to make the most sense. 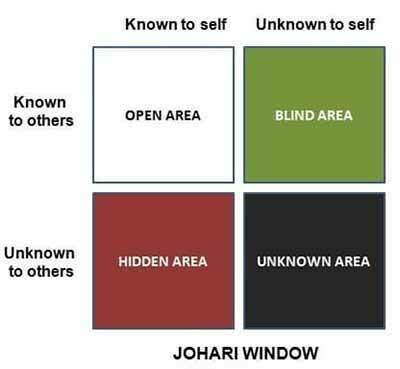 The Johari window is essential to create as it will help you identify what you should be communicating with your audience. It enables you to create an impact! It helps you to understand what you know and don’t know, what your audience knows and doesn’t know, and what neither of you knows so that you can create the most effective marketing message. When building your Johari window focus on strengthening relevance, value, and credibility with your audience, what is important to them? In the end, it’s all about what is in it for them so focus your brainstorming around this idea. The easiest way to identify what goes in your open window is to use your marketing material and website. What is the marketing message you are sharing? What is your value proposition? What are your benefits, and what do people know about you? Anything that is known to you and your audience that benefits your business goes in the open window. What about your business do you know that your audience should know? What haven’t you shared that could help your marketing message and business achieve more credibility, more relevance, and strengthen your marketing value? The blind window is where you enter this information. Say you have an award that you haven’t highlighted that would help with credibility. Maybe you offer a discount to larger clients that competitors do not that would add value to your mix. It is in this window that you are looking to strengthen and expand your marketing message! Doing some competitive research at this point is also a great idea as you may find some areas that you have been missing or could add to your mix. The blind window is where you want to look for areas that you may not be aware that your audience does know. Tactics to accomplish this could include checking with customer service, reading reviews, social listening, testimonials, analytic, and CRO testing results, etc. This window will likely have the fewest entries. At the same time, as you are researching the other windows, you may come across things that you no one was aware of, and you’d enter those here. 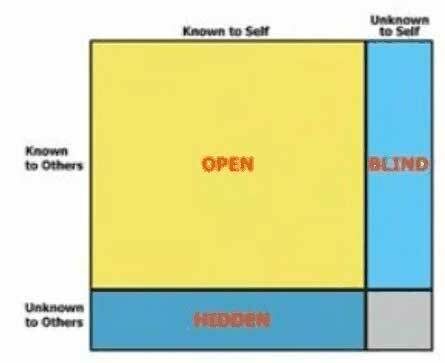 The goal of the Johari Window exercise is to bring as much about your business and marketing message out into the open as possible. Keep in mind that you want to focus your entries on relevance, value, credibility, and even your calls to action. The context of this exercise is to develop a deeper understanding of what you should be communicating with your audience, i.e., what is going to have the most significant impact with them. The next thing we are going to tackle is how to communicate with your audience in their way. You know what you want to communicate; now it’s time to figure out how to speak your audience’s language. Have you ever run across a beautifully built site or landing page that wasn’t converting well which didn’t make sense to you at all? I have, and this one can be frustrating especially if you dropped some money on the new design. 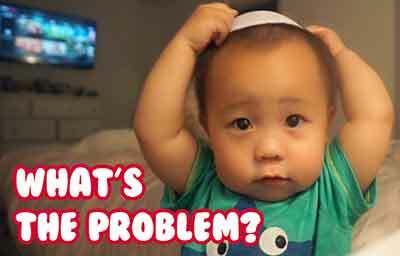 This problem can be tracked, in most cases, back to the site or landing page not communicating to the audience in their way. Yes, the website or landing page may be fantastic, but if it is not speaking to the correct buying persona(s), the correct language, it will struggle; or, at the very least, not produce as expected. That said, how do we gather an understanding about who we are trying to persuade, and how to present our content in a way that will ring true with them? Welcome, Persuasion Architecture to the stage! 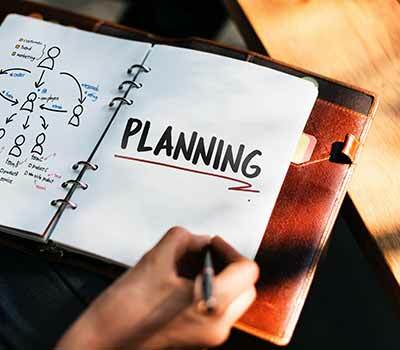 Persuasion architecture is a method design by Bryan and Jeff Eisenberg, that is used to identify who it is that you are trying to persuade and how to go about persuading them in their way. It’s made up of four persona buckets that have communication attributes assigned to them, based on their research, that then guides you in how to communicate. 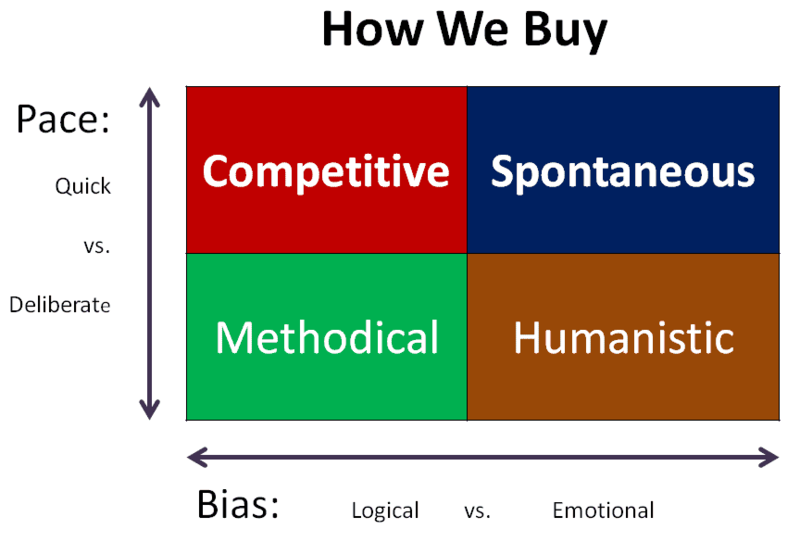 Keep in mind that these personas are not like your traditional personas that you may already be aware of, but instead, are modalities of buying that people get into based on what they are researching. For example, an I.T. manager researching an expensive piece of software their company needs will more than likely conduct their research differently than if they were looking for a teddy bear for their daughter’s Christmas present. When you are working on figuring out how to best communicate with your audience, the first place to start is with purchasing pace and emotion. For example, the competitive persona is going to be quick and logical, while the humanistic persona is going to be slow (deliberate) and emotional. Methodical on the other hand is going to be slow and logical, while spontaneous will be quick and emotional. 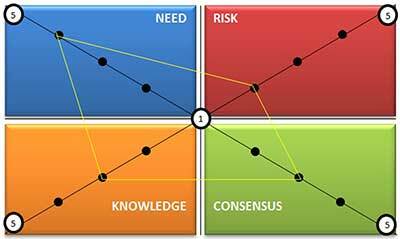 By just understanding, the pace of your audience you will be in the ballpark, and from there with a little common sense, you can land in the correct quadrant. To learn more about using personas check out this video from Bryan Eisenberg! 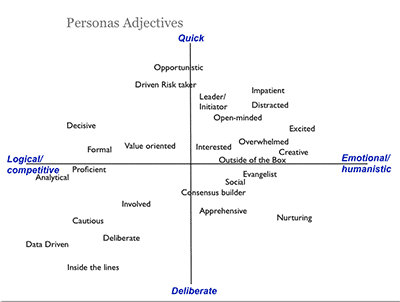 Another way to help you develop your personas profiles is to create a persona adjective chart. You create this by adding adjectives into the proper area within the buying chart as shown here. (It’s a good idea to include the team when creating this chart). Using this strategy to then helps you identify the dominant modality(s) your audience is using, and this, in return, enables you to understand the persona(s) you should be targeting with your content. In the meantime, finish the steps above as they will significantly enhance the understanding you have of your audience. Thanks for reading! Please leave comments or questions below!